Alhamdulillah mulai minggu lalu, kuliah Zuhr yang biasa diadakan di Fakulti Perubatan UiTM telah di sambung. 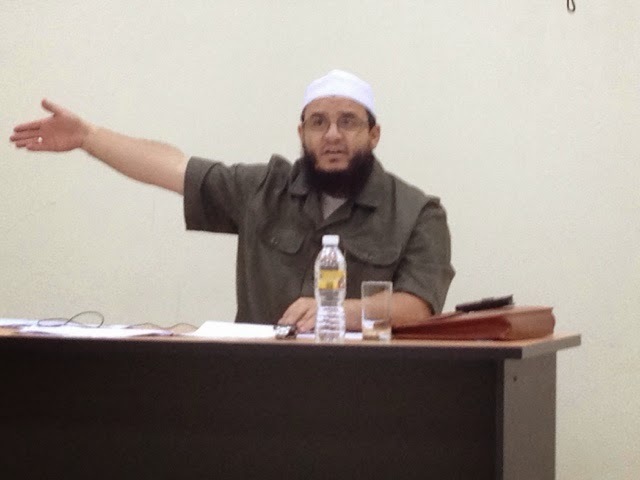 Penceramah yang didatangkan khas dari UIA iaitu Sheikh Zubair, berkongsi ttg Dajjal. - on his forehead "kafir"
Is he mentioned in the Quran? - Fatimah bint Quwais narrated the hadith , she prayed behind Rasulullah & Rasulullah said, "sit down, don't leave, I have something to tell you. Sit at your place. I have no reason to call you except a Tamim Ad-dari (former nasrani) told me exactly what I have told you about dajjal. " He (Tamim) went on a ship with 30 men from Lahm & Judain (tribes who lived near the sea). There was bad weather & they got lost 1 month in the sea. Then they found an island near Maghribi. They went into the island & found new creation (hairy, they cannot recognise the face or the back), they ask what are you? They said "I am the spy of the island. I am a spy of something big. Follow me, there is someone waiting eagerly for news (cuffed at the hands/ feet/knees/ neck). "We thought it was the syaitan so we were scared. We asked is this syaitan? Albeit feeling scared, we followed as we needed water. " Then he said "Tell me about the palm tree of Bisan (this place with the best dates)". Is it still giving fruit? Then he said, tell me about the lake of Tabariah. Does it still have water? Then he said," Tell me about the spring of Zuhr, does it still have water & people still use it for agriculture? " "Tell me about the Rasul of the the ummi "
They (sahabah) said, " he was in Makkah & then moved to Yathrib "
Dajjal: Does the arab fought him? Dajjal: Did he win or lose? Note: it is not impossible for Dajjal to be of big size as people of Ad & Thamud were also big. Makkah & Madinah is the only places Dajjal cannot enter. Dajjal's Army - there will be war. They will emerge, from the east of Makkah, sea of Iran. Hadith: He will come from Khurasan, a city called Marru from the community of Jewish - not a normal jewish as he claim he is a prophet , later he claimed he is God. 70,000 of Jewish of Iran will follow them. How does he impress people? He has a donkey - between the 2 ears is 40cm. (Huge) - doesn't listen except to him. He will enter each & every city. No city will take longer than 40 days for him to take over, he use black magic. - rivers start drying up (no more water) even in Selangor! - can go for football match but not for Fajr prayers . Eg Kedah Vs Kelantan, the whole stadium will be filled but look at the masjid the following Fajr.